Blackleg infection at or just after the cotyledon stage is the mostly likely to cause any significant yield loss. If fungicide to control blackleg is to provide any economic benefit, it has to be applied very early in the season and the crop has to be at risk of early and fairly widespread infection. With good management, including a two-year break between canola crops, growing blackleg resistant varieties and rotation of R genes, fungicide is not necessary. In that situation, fungicide to reduce blackleg losses does not usually provide an economic return. –The fungicide is applied early. The earlier the better but follow product labels. –Careful scouting shows that a high percentage of stubble pieces from the previous crop have pseudothecia. –Earliest cotyledons already have small blackleg lesions (which are very difficult to see). 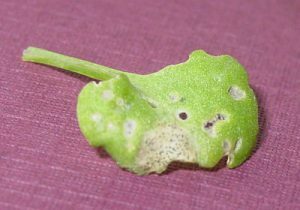 Fungicide are protective – they cannot cure existing infections – but these early lesions could be a sign of more to come. –Plants have entry wounds from hail, flea beetle feeding or other reasons. Blackleg can be taken up by the plant’s stomata, but entry wounds allow for more infection. Fungicide will be $10 to $15 per acre, depending on the product and rate. If the situation suggests a return on investment is possible, fungicides can be tank mixed with herbicide as long as herbicide is applied early.